The Verify Face Information dialog appears after you select the face you want to examine, using the Face feature available from the Tools>Verify submenu. What is the geometry that defines the face? 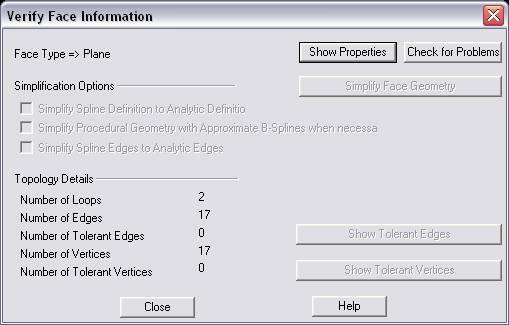 The face geometry can be defined by a Plane, Cone, Cylinder, Sphere, Torus, Exact Spline or various Procedural Splines. Planes, Cones, Cylinders, Spheres and Tori are classified as analytic geometry since they can unambiguously be represented by a simple algebraic formula. Procedural splines are a special type of spline geometry. This type of geometry is typically created by a specific modeling operation. For example, ”r;Rolling Ball Blend” or ”r;Vertex Blend” face geometry typically gets created during a blending operation. Is the Surface Rational in U and V? Is the Geometry Closed in U and V? Is the Geometry Periodic in U and V? Number of Control Points in U and V Direction? Number of Knots in the U and V Direction? Selecting this button will cause the function to check the face for any problems. A dialog will be displayed with the problems found with the face (if any). The number of loops on the face is displayed. A loop represents a connected portion of the boundary of a face. Each loop determines the portion of the surface that is inside the face and the portion that is outside. The number of edges on the face is displayed. An edge constitutes the boundary one or more faces. It is bounded by two vertices. The number of tolerant edges on the face is displayed. If tolerant edges exist on the entity the ”r;Show Tolerant Edges” button will be enabled. Selecting the button will cause the results dialog to temporarily disappear. The tolerant edges on the face will be highlighted. You may select any one of the highlighted edges to get its tolerance. Click on ACCEPT in the Conversation Bar to model temporary geometry indicating the tolerant edges. Clicking either BACK or ESCAPE will un-highlight the sliver faces and return you back to the results dialog. The number of vertices on the face is displayed. A vertex is the corner of a face and refers to a point in 3D space. The number of tolerant vertices on the face is displayed. If tolerant vertices exist on the entity the ”r;Show Tolerant Vertices” button will be enabled. Selecting the button will cause the results dialog to temporarily disappear. Temporary points will be drawn to indicate the tolerant vertices on the face. Click on ACCEPT in the Conversation Bar to leave points in the part. Clicking either BACK or ESCAPE will un-highlight the sliver faces and return you back to the results dialog.